Investing in the best cheese slicer can take care of many problems associated with using the traditional utensils for the same purpose. You can try hard but you cannot achieve the proper and same piece of cheese by using a knife in the place of a cheese slicer. Besides, cutting cheese with your ordinary kitchen knife leaves some residues on the table. This will force you to use additional time and energy to clean the table before you can cut the next piece. Imagine how long it will take you to prepare sandwiches for your family and friends. Possessing a good cheese slicer will eliminate all these problems. It might help you save time and effort that you might otherwise spend working with inappropriate utensils. When it comes to cheese slicers, these are lots of fanciful handheld models, adjustable wire models, planes, boards, and cutters. Making an informed choice could be difficult without experience and knowledge. That’s why we’ve created in-depth best cheese slicers reviews. Hopefully, you can find what you are looking for. The Bellemain Adjustable Thickness Cheese Slicer is perhaps the most versatile of the slicers we have reviewed here. It features an adjustable stainless steel wire that cuts even and precise slices. What’s more, you can adjust the thickness of the resultant slices as you desire. Paper thin, thin or thick slices – the choice is yours. The slicer works perfectly for different types of cheese. It does not matter if the cheese block you wish to slice is semi-soft, or somehow harder. 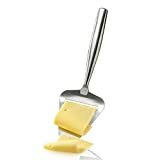 This product has been termed the best cheese slicer for hard cheese. Its rugged stainless steel wire cuts nice slices to perfect and precise thickness. The slicer can handle cheese blocks up to 3.5 inches wide. Simply adjust the tool to deliver beautiful, chunky slicers up to 0.25 inches thick or wafer-thin slices. You’ll find this slicer great if you love slicing cheese for trays. The Bellemain is one of the most elegant and durable cheese slicer models currently on the market. The manufacturer cast it from a single piece of zinc alloy. This heavy duty and a sturdy construction guarantee you service for decades. You can have confidence on this utensil because it comes with a full 1-year warranty as well as a replacement cutting wire. German technology is seen in all their brands. Even a mundane product such as a cheese slicer gives the evidence of the superiority of German industrial prowess. The Westmark Germany Cheese Slicer is a testament to that fact. The slicer is angle adjustable. It means the thickness of the cheese slices to expect varies from the angle at which you hold the slicer. The product is extremely durable thanks to the heavy duty and sturdy materials used in its construction. One such material is high-quality stainless steel wire and roller. The handle is made of cast aluminum which is both strong and lightweight. The handle is comfortable and ergonomic. 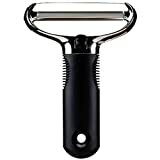 The stainless steel wire cuts both soft and semi-hard kinds of cheese precisely and with ease. It cuts cheese efficiently saving you time and energy while at the same time delivering professional results. You can slice enough cheese for your whole family or friends in no time. Although the Westmark Germany Slicer may not be dishwasher safe, cleaning it is still a breeze. All you need is soap and water to clean the product effectively. The tool is backed by a whopping 5-year warranty. This means Westmark has full confidence that you will fall in love with their product and that it will exceed your expectations. You can be confident that you are buying a durable and dependable slicer. Fox Run has been a successful company in the kitchenware sector for years. The 3841 Marble Cheese Slicer is just but one of their most loved products. The elegantly designed slicer has a base measuring 8 inches by 5 inches. The base is made of beautiful 100 percent marble. Marble is a natural stone with different patterns and coloration. This means you cannot miss one that matches your kitchen décor. And this is the beauty of Fox Run 3841. The base has non-slip rubber feet that help to reduce unintended sliding while the product is in use. The slicer is fitted with sturdy and durable stainless steel wire capable of cutting through soft, semi-soft and hard cheese. Even more interesting is that Fox Run provides buyers of this product with two replacement wires to provide for long-term use. Cleaning the 30842 Marble Cheese Slicer is a breeze. Just wash it with clean, warm and soapy water and then pat clean. One thing that you will love about this slicer is its versatility. The slicer’s base doubles as a serving board. This is because of marvelous contrast in the marble stone. The boards can stand out on kitchen countertops and serve as awesome serving pieces. If you get a chance to use the Norpro Heavy Duty Adjustable Cheese Slicer, you will never again consider getting pre-sliced cheese from the grocery stores. This may sound a farfetched claim but take a good look at the product. It has some great features that allow it to deliver precise, even slices easily. It allows for adjustment. All you need to do is adjust the cutting wire for thin or thick cutting depending on your personal preferences. Once adjusted, the tool will cut both soft and hard cheese consistently and with ease each time to your preferred thickness. This is one of the best slicers you can buy if you are looking for one to help you when you want to throw a party for your friends and colleagues. It will come in handy when you want to serve cheese sandwiches or platters for lunch. The adjustable cutting wire is made of stainless steel while the roller and the handle feature heavy duty zinc alloy. This construction will ensure the product gives you years of service without requiring a replacement. Each Norpro Heavy Duty Adjustable Cheese Slicer comes with an extra replacement stainless steel cutting wire. Made of elegant thick beech wood, the Prodyne 805B cheese slicer is a marvel when it comes to kitchenware. It features natural beech wood that mixes with brushed and elegant slicing stainless arm and a handle grip. The handle grip is very comfortable and ergonomic to the hand. A natural finish on the beech wood board provides you, the server, with an elegant and sophisticated look that will match the occasion. It is fitted with sturdy stainless steel cutting wire that easily sinks into both hard and soft cheeses with the same accuracy. This results in the perfect slice, thin or thick, each time you use the tool. The wire is replaceable and features Prodyne’s lifetime warranty against breakage. The large board measures 9.5 inches x 6 inches and is fitted with non-slip rubber feet for stability during use. The non-slip rubber feet will also protect your kitchen countertop from damage. This feature is common to all board type cheese slicers made by Prodyne. The company offers its customers a lifetime warranty for the stainless cutting wire. Besides, each unit also comes with a replacement cutting wire. This gives you a long time of service. Prodyne is confident the wire will not break easily as long as you use the slicer appropriately. When dirty, simply wash the cheese slicer with a mild detergent. This will keep the beard and the brushed stainless steel parts looking good and new every time. The elegant and futuristic design of this multi-purpose stainless steel cheese and food slicer makes it one of the best cheese slicers for hard cheeses. The Westmark Germany multipurpose cheese and food slicer is top rated and loved many chefs who care about serving their guests and family with best sandwiches and platters in addition to other foods. Westmark is well-known for durability. This product features a high-quality stainless steel blade and heavy-duty cast aluminum for its handle. The handle is both durable and highly ergonomic. It also features a nice base made from ABS material with an adjustable scale made from polypropylene. This multipurpose slicer slices not only the soft and hard cheeses; it can also slice other food items such as pepper, sausages, radishes, cucumbers, and lettuce among others. It will not just slice these food materials; it will do so in the most efficient way providing excellent results. The unit is extremely easy to use and maintain. All you need is to clean it regularly after use. Simply use soap and water to clean your slicer. You can then leave it to air-dry and then store it in a cool dry place. All parts are rust-proof. The RSVP Polished 8×5 White Marble Board Cheese slicer offers you an excellent way to slice or cut and serve various types of cheeses – perfect for all kinds of occasions. As you can see from the name, it comes with a base that measures 8 inches by 5 inches. The base is made of elegant and luxurious polished marble stone. The base has on it stainless steel wire cutter and lever. Each piece has a unique color and pattern given the different properties of marble stones. It is thus not difficult to find one that will complement your kitchen countertop décor. The marble stone does not stain easily. But you need to clean it regularly soon after use to ensure it remains as clean as new. All you need to clean it effectively is clean, soapy water that is warm. Keep in mind that the unit is not dishwasher safe. 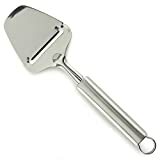 The Norpro Stainless Steel Cheese Slicer is currently the #1 Best Seller product on Amazon in the of cheese knives. You have to keep in mind that Amazon is the world’s largest and most popular online stores. Thus the quality of this cheese slicer speaks for itself. The slicer is made of professional gauge stainless steel giving it high levels of performance and durability. You will find a perfect kitchen accessory if you are a lover of cheese in this unit from Norpro. It is perfect for your need to slice different types of cheese ranging from hard to soft. You can also use the tool to shave frozen butter and chocolate. It features a 2-inch wide, super-sharp angled blade that ensures thin, uniform slices. You will love to serve your most valuable guests with the professional grade sandwiches and platters from this great tool. The handle of this cheese plane/slicer is rounded in design. It will fit perfectly in your hand for hassle-free work. Even better is a convenient hang hole that provides for effortless storage. The handle is also solid filled making it feel full, comfortable and ergonomic in your hand. Despite the great features, the Norpro Stainless Steel Cheese Plane/Slicer is dirt cheap. The OXO wire cheese slicer is both functional and fashionable. It comes with a stainless steel wire that is controlled by a tension wheel. The wheel allows you to tighten the wire when it gets loose. All wire cheese slicers have the problem of the wire cutter getting loose with use. OXO has found an innovative way to deal with this inevitable problem. It is very easy to load the wire and when properly loaded, it can let you slice through semi-hard and hard cheeses with little effort. The handle features an ergonomic design that that offers you optimal comfort during use. Featuring zinc alloy construction, the slicer is compact and sturdy. You can also wash it in your dishwasher without worrying about getting it damaged. Each package includes an extra replacement wire to allow you to use the tool for long without requiring complete replacement. It only takes a minute to change the wire and no skills at all. Even more beautiful is that you can buy the wires separately if there is a need. One great thing about this slicer is its angle adjustability. To change the thickness of slices you cut, simply change the angle of your wrist. The only drawback is that many people cannot achieve consistent and uniform slices with angle adjustable wire slicers. The last but not least in our in-depth best cheese slicer reviews is the Boska Holland Monaco Collection Stainless steel cheese slicer. It is potentially the best cheese slicer for hard and semi-hard cheeses. Both the handle and the blade of this slicer are made of stainless steel. This gives the tool admirable levels of strength and durability. This tool offers you the easiest way to make thin slices of semi-hard and hard cheeses. The sharp blade makes quick slicing. However, you must be careful of the sharp blade because it could cut your fingers. Tool measures 3.15 x 0.8 x 11 inches, which is rather on the small side but many people prefer the compact and sturdy models. It may be more expensive when you compare with other brands and models in its category that are selling on Amazon. Nonetheless, that is what you should expect from a high-quality slicer. Besides being a great performer, it will add a touch of luxury to your kitchen collections. You know you must clean your slicer after use. Well, this unit makes it easy for you. 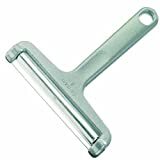 Since all parts are made of stainless steel, the tool does not stain. Yet you will still need to clean it to ensure it stays sparkling clean. All you need to do is throw it in a dishwasher because all parts are dishwasher safe. 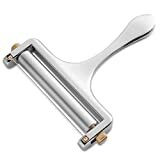 We can safely assume that the discussion we’ve had so far has proved useful in your drive to find the best cheese slicer for your sandwich needs. We also understand that people have different tastes and preferences. So, it is possible that your desire is not with the ten slicers we have reviewed. Do not despair because we are going to give you a definitive guide as well as useful tips to help you make your own decision. In the past, we had to depend on ordinary kitchen knives to slice cheese when we wanted to make sandwiches. Such knives we messy and they were not able to give us thin cheese slices that we wanted. In fact, the inventor of this utensil developed it after frustrations with making thin cheese slices with an ordinary knife and other cutlery. Soft cheese such as brie is messy to cut with just any tool. It is even more problematic if you want to make thin slices that will easily melt when used to prepare a sandwich. You will have to clean the table after each cutting. This will waste your time and energy. A good quality cheese slicer makes super thin slices without creating any mess. 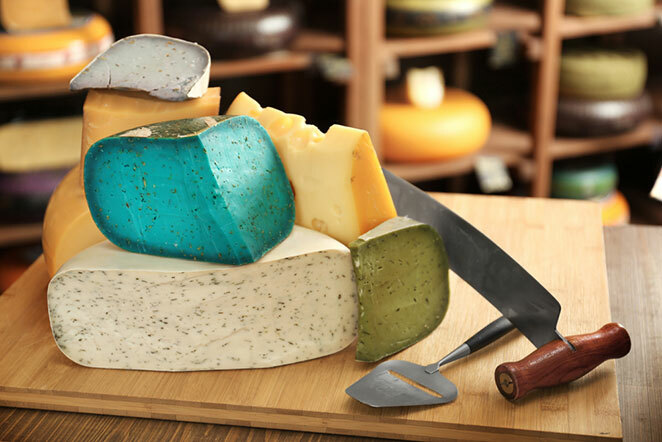 Cheese deposits will less likely stick on the wire cutter or on the table. Besides, the process is too fast because you have no blades to sharpen. If the wire starts to discolor, it is time to change it. The bottom line is that investing in a good quality cheese slicer will help you save time and energy. You can also expect better results. There are three basic types depending on design. Having this knowledge is important because it will help you make a decision based on your personal needs. This type assumes a letter “T” which divides its structure into 3 parts. There is the body, the roller and a stainless steel wire. The roller connects to the body via two posts on either side. The roller is usually adjustable at its connection sites to allow for thickness adjustability. A rolling cheese slicer is very easy to use. Just place the cheese block in front of you. Pull the roller lightly over its surface in your direction. 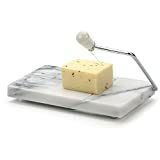 As the roller rolls, the wire cutter slices cheese without leaving any residue on the surface of the slice. This slicer type works best on soft and semi-soft cheeses. Remember to slice when the cheese is cold to obtain the best results. You can also use it to slice harder cheeses as long as you leave them at room temperature for some time to ease cutting. 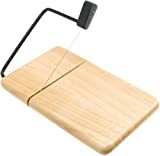 The design of wire cheese slicer comprises a plane board and an armed attached to it. The arm has a stainless steel wire that slices the cheese. Most wire cheese cutters have bigger dimensions with the large surface area. Such design makes them ideal for cutting larger cheese blocks. The larger dimensions mean the slicer requires larger space to operate. However, they work perfectly to deliver plane, straight and clean slices of cheese. With a wire cheese slicer, you could slice soft, semi-soft and hard cheeses with minimal effort. The results are awesome. A plane cheese slicer is small but sturdy in design. The construction consists of a handle and a flat upper portion. The flat part features a sharp blade at the center of a wedge. Slices are formed as you shave the cheese with the slicer. This results in super thin. However, the slices will never look as nice as they would with other the rolling slicer or the wire slicer. The slicers will come out somehow misshapen, narrower and unclean. This type works better with semi-soft and hard cheeses. 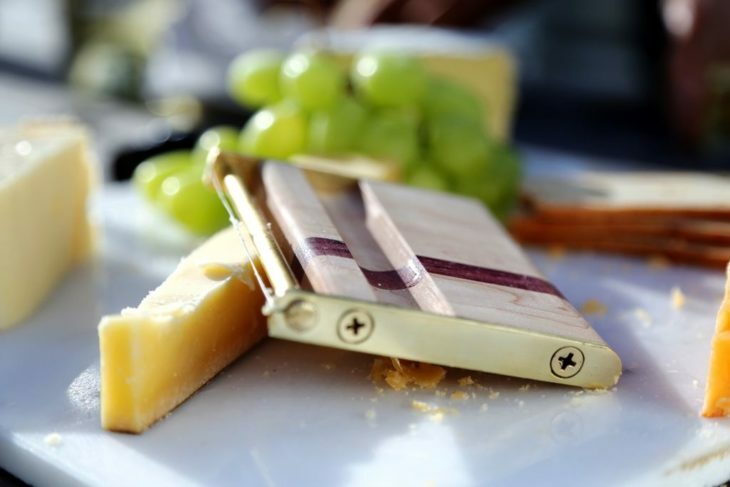 To deal with the unsightly outcome, plane cheese slicers feature sharp blades with a non-stick surface. This will provide clean somewhat textured slices. We can round cheese slicers into three categories based on the material used in their construction. There are wooden slicers, marble slicers, metallic (alloy) slicers. The wooden cheese slicers are preferred because of their lightweight and relative safety when it comes to bacterial contamination. Some feature choice woods that look stylish and luxurious. The marble slicers look beautiful, stylish and luxurious. Most are thick and durable. Marble stones are all unique in color and pattern. The flipside is that they tend to be heavier than other types. High-quality brands tend to have rubber feet to protect your kitchen countertops. Metal (alloy) types usually feature a wire that cuts cheese into desired slices. Most are made of stainless steel but you can also find other alloys such as zinc or aluminum. These slicers are rust free and durable. You need to look for ways to save money. One such way is to buy strong and durable products that will serve you for long without requiring replacement. The major determinant of durability is the build material of the slicer. If it is wooden then there are different types of wood that differ in terms of durability. The same goes for stainless steel models. There are different grades of stainless steel. This has a direct influence on the durability of the slicer. You have to pay particular attention when it comes to the wire cheese slicers. The wire tends to loosen or wobble with time. The frequency of replacement will depend on the quality of the stainless steel used to construct the wire. Since most cheese slicers are used at home, it is imperative that you consider the safety of your family when making your choice. The types that feature sharp blades are dangerous as they could easily chop off the finger of a kid playing with it. The plane cheese slicer is not suitable for use where little kids no matter how careful you are. Avoid it if you are careless in handling stuff because it could sever your fingers unintentionally. Slice thickness also varies with the occasion and your expectations. All the three types of cheese slicers differ in their capability when it comes to the size and quality of the slices. Different brands and models also differ in the quality of slices they can produce. None of the types rival adjustable cheese slicers when in terms of slice thickness. Angle-adjustability may also help you vary the thickness of slices but straightness and consistency cannot be guaranteed. You’ll need to do your research in this area before you make a commitment. This factor only influences your choice if you have decided to go with wire cheese slicers. A good cutting wire should have a non-stick wire that is detachable and replaceable. Even more important is the ability to adjust the tension of the wire. Some reputable brands will include in the package an additional wire as a backup. You can also buy replacement wires separately. It is important to match the wire to the slicer. A good advice is to buy several replacement wires at the time of buying the slicer. This will minimize the chances of slicer/wire mismatch. This is rather mundane but most of us love utensils that do not give us a headache to clean, maintain and store. The best choice should be one that is easy to clean and requires hassle-free and minimal maintenance. It should also occupy little storage space in the kitchen. A dishwasher safe feature is a wonderful advantage. But, in its absence, cleaning the slicer should take only water and soap. Most models are made of stainless materials but you’ll still need to clean them after each use. Warranty policy is a sign of the manufacturer’s confidence with their slicers. Generally, high-quality cheese slicers feature long warranty policies some going as much as 5 years. You should also look at the terms of the policy. The best and most reputable brands may offer a lifetime warranty for their cheese slicer models. As far as the best cheese slicer reviews are concerned, we have tried our best to cover the basics to help you make an informed choice. A cheese slicer is a versatile tool for all serious cooks whether you want to serve your family, friends or even colleagues. The best results start with making the best choice. The information we have provided, you cannot go wrong even if you are looking for the best cheese slicer for hard cheeses. It is always safe to go popular and reputable brands. They have established themselves in the market making them versatile and dependable.